President Barack Obama was at State College Thursday to talk to students about new technologies and to propose a freeze on domestic spending. President Barack Obama says fresh investments in clean energy technology will bring new jobs to the U.S. and help lay a foundation for long-term American prosperity. Obama is calling on Congress to provide companies with a tax credit to reward them for retrofitting their buildings in a way that decreases energy use. He's also calling for broader access to financing for businesses that want to make energy-saving upgrades. During remarks at Penn State, Obama said making buildings more energy efficient is one of the fastest, easiest ways to save money, combat pollution and create jobs. The president says energy efficiency research being done at PSU is an example of the kind of work that can create jobs during an economic recovery. Obama toured a lab spearheading federal research at the Philadelphia Navy Yard before a speech Thursday at Penn State's Rec Hall. 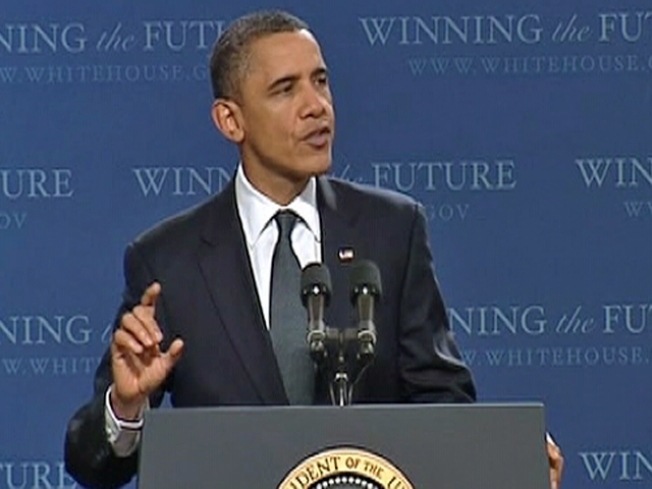 The president also proposed a new tax credit and other initiatives that he said would help create more jobs. The Penn State research is aimed at finding affordable ways to make buildings more energy efficient. Six protesters waited outside Rec Hall about an hour before the noon event. Earlier Thursday, PennsylvaniaGOP chairman Rob Gleason questioned Obama's energy policies and criticized what he called the administration's attitude toward industry. Obama's trip here also underscores the White House's increased focus on the president's reelection: Pennsylvania is sure to figure prominently in that bid. The President also addressed the escalating situation in Egypt. To read his remarks, follow this link.